AbgalAliensAncient AnthropologyAnuAnunnakiAnzuAquarian RadioArticlesEnkiEnki SpeaksEnlilMardukMediaNibiruNinurtaPlacesRadioSasha Lessin, Ph. D.
Eight to twelve foot-tall Homo Sapiens like us—the Anunnaki—mounted a goldmining expedition from the planet Nibiru to Earth, some 440,000 years ago. They mined gold in southeast Africa, shipped it in submersible boats up the Persian Gulf and flew it from Iraq and Lebanon to their transshipment and astronaut (Igigi) base on Mars near Cyndonia. Anzu, leader of the lineage of deposed Nibiran King Alalu, ruled 300 shuttle-service astronauts on Marsbase as well as those in orbit above Iraq. His men, the Igigi, rocketed to Sippar and loaded gold and returning workers from Sippar to Mars and from Mars to Nibiru and flew replacements and supplies back to Earth every 3,600 years or so. On Nibiru,scientists powdered and spread the gold into the sky to hold Nibiru’s atmosphere. “On Earth the Anunnaki toiled, of work and sustenance they were complaining. The elixir they only small rations were given. In the Edin [Sumer-Iraq] they toiled, in Africa their work was more backbreaking. Anzu and the Igigi demanded that Commander Enlil better their work-conditions, issue more elixir and build a recreation center on Earth. 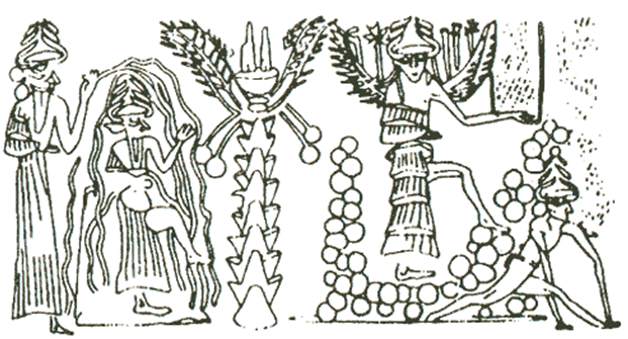 Anu, from Nibiru, ordered Anzu to Earth to talk with Enlil. The King told Enlil to show Anzu everything. But when Enlil stripped, Anzu stole his keys, slipped into the control room and seized the crystals [computers] that ran Sumer’s spaceport and cities. 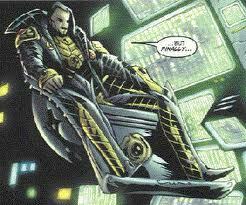 Anzu forced pilot Abgal, Chief of the Landing Platform at Lebanon, to take him to Shurupak the spaceport. There, Anzu”s men—the “Martians” who invaded–declared Anzu King of Earth and Mars. Anzu turned off vital services at headquarters (Nibru-ki), cut Earth-Nibiru communications, and, from his aircraft, buzzed Enlilite positions. Enlil’s son Ninurta launched his jet and shot Anzu down. Cuneiform tablet depicts Ninurta, on the right, flying (ie winged) at Anzu. 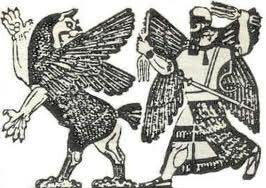 Ninurta took Anzu before Enlil. The Seven Who Judge–Enki, Damkina, Marduk, Nannar, Enlil, Ninmah and NinurtaBfound Anzu guilty of treason. Ninurta killed him with a ray gun. Marduk replaced Anzu as Marsbase boss. 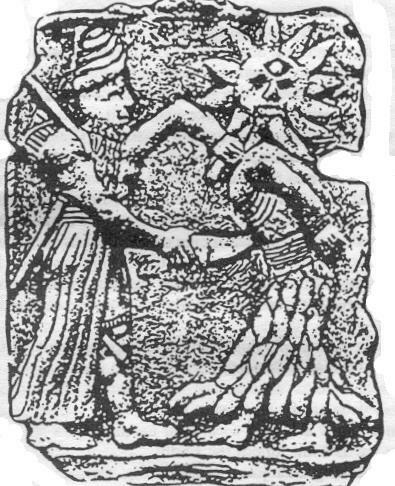 Ninurta, now Enlil’s “Foremost Warrior,” enforced Enlil’s rules to extract, process and send gold to Nibiru.